Lots of information on steamboats and their operation can be found the SBA's latest publication: the "Steamboating Guide" 2nd Edition which has been fully-revised and greatly-enlarged by Roger Calvert and Rob van Es, sample pages can be downloaded and the full paper copy can be purchased via the SBA shop priced at £9.50 plus P&P (paperback). Any recreational activity on open water has inherent hazards, as does the operation of machinery on water craft. The Steam Boat Association of Great Britain advocates that operators should take all appropriate precautions to minimise the risk of injury whilst enjoying the rewarding experience of running a steam boat. It is recommended that steam boat owners have third party insurance and that the insurers are made aware that the craft is steam powered. There are several insurers who specialise in insurance for steam vessels, some of which advertise the members’ periodical "Funnel" For the insurance to be valid, the steam plant will need to be examined by a competent person and certified as satisfactory for service.Most inland waterways and harbour authorities require specific minimum levels of third party insurance. Boats attending events organised by the SBA must have insurance and steam plant certification. It is recommended that anyone new to operating steam plant should seek appropriate guidance before operating steam machinery under pressure. The Steam Boat Association is in a position to offer assistance through Area Representatives, who can put new members in touch with experienced steam boat owners. 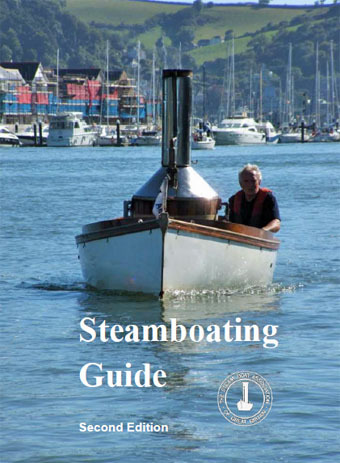 The SBA has published for its members a Steamboating Guide which contains advice on building and running a steam boat safely. It is recommended that precautions are taken to ensure the safety of crew and passengers whilst on or close to water. Life jackets or buoyancy aids should be worn, on unfamiliar waters it may be appropriate to seek advice about hazards which might exist, training by a reputable organisation such as the RYA is valuable. An anchor with suitable warp for the depth of water should be carried, and a fire extinguisher should be readily accessible. Further suggestions for the welfare of all on board are also to be found in the Steamboating Guide. It is recommended that a steam boiler should not be operated under pressure unless it has been examined and found to be satisfactory for service by a competent person. The Steamboat Association of Great Britain is not a regulatory authority and offers the above recommendations in good faith.